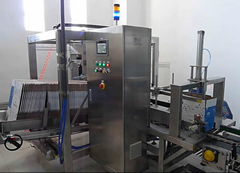 It is a part of Fully-automatic Bag-in-Box Packaging Line, but can be individually used to erect cartons for other products packaging. Grade 304 stainless steel construction, ideal for water, beverage or food-grade fluids. It is a fully-automatic carton erector and operates in a continuous cycle: opening a carton, sealing the bottom with hot melt glue, squaring and exitting the box. 2) Easy to change if a different box is used.